The most comprehensive report on the size of SRI across Europe is the Eurosif report which is published every two years. The 2016 report highlighted that exclusion-based strategies remained the most popular SRI approach and that impact investing was the fastest-growing strategy, albeit from a very low base. The Responsible Investment Association (RIA) of Canada produces reports on the SRI market in Canada. The latest data was incorporated in the GSIA 2016 report but there is more detail on the impact investing market in their 2016 Canadian Impact Investment Trends Report. The most comprehensive report on the size of SRI across the USA is the US SIF report which is published every two years. Highlights from the 2016 report included a 33% increase in SRI assets under management since 2014 and the increase in client demand as a key driver of ESG integration for fund managers. Measuring the size and shape of the SRI market (or the level of investor engagement with sustainability and corporate governance issues) is complicated. Forecasting market growth even more so. We advise any organisation investing into this market to form their own view of the size and growth prospects of the market that is relevant to and addressable by their organisation. We have given some well-known measures and proxy measures of the market below. The Global Sustainable Investment Review is issued every two years by the Global Sustainable Investment Alliance, a group of sustainable investment associations around the world. Members include Eurosif, Responsible Investment Association Australasia, RIA Canada and US SIF. The most recent version was published in 2016. Its findings have shown consistent growth in sustainable investment around the world, with an estimate of $23 trillion of assets being professionally managed under responsible investment strategies, though this definition has altered over time to become more precise. The UN-backed Principles for Responsible Investment (PRI) was launched in 2006 with six guiding principles for asset owners and managers to incorporate ESG issues into their investment processes. More than 1,800 organisations have signed up to the principles, representing around $70 trillion in assets under management. Signatories have grown consistently since launch and can be used as a proxy for the growth in the SRI market as investors must report each year on their progress towards implementing the principles and can – in theory – be removed from the PRI if they fail to comply. CDP was set up fifteen years ago as the Carbon Disclosure Project, an NGO which promotes disclosure of climate risks by companies on behalf of signatory investors. 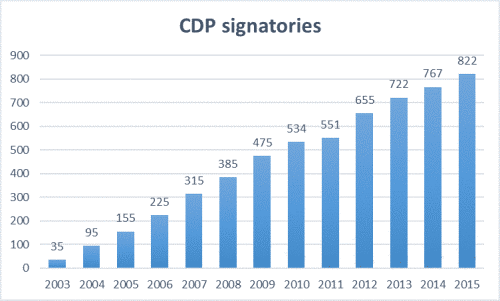 More than 650 asset owners and managers are signatories of CDP, representing around $87 trillion of assets under management – this number decreased last year as CDP began to charge investors a fee to become signatories. The rise in signatories broadly reflects the rise in interest in climate-related issues from investors and can also be used as a proxy for growth in the market. SRI-CONNECT, the global online market network for sustainable investment and corporate governance, updates the user numbers and site usage levels on a quarterly basis here.